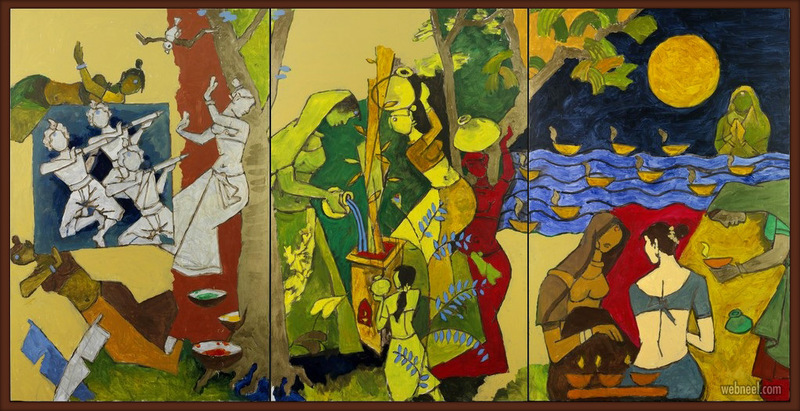 We have included MF Hussain's modern indian paintings. 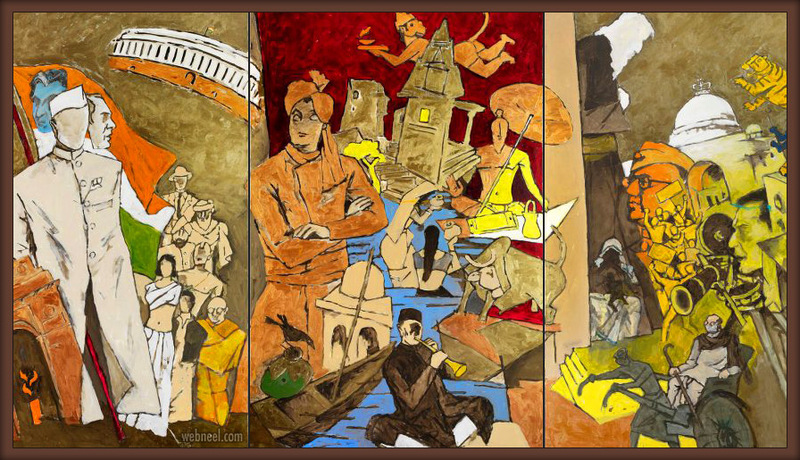 He is a talented indian artist who is known to have founded indian modern paintings. 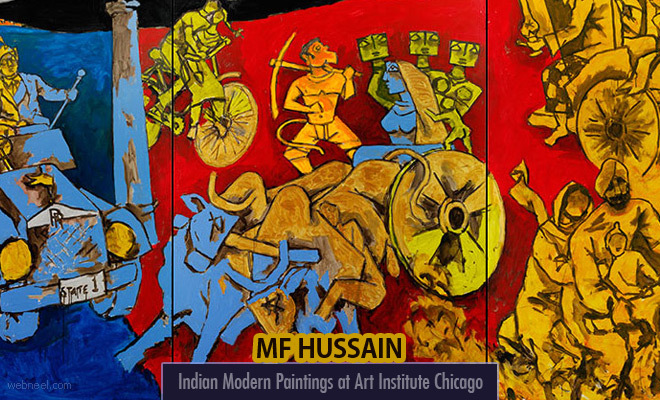 MF Hussain paintings are quite popular and he is known as the 'patriarch of the palette' by the Art Institute Chicago. Lakshmi and Usha Mittal at London commissioned his artworks and it's the first time for MF Hussain artworks to be displayed in USA. There were different categories relating to Indian traditions and culture which were portrayed in the modern paintings. Indian festivals are very colorful and loved by every Indian. Through this festivals and households, he portrays the different ways of celebrations which occured in different periods of time. 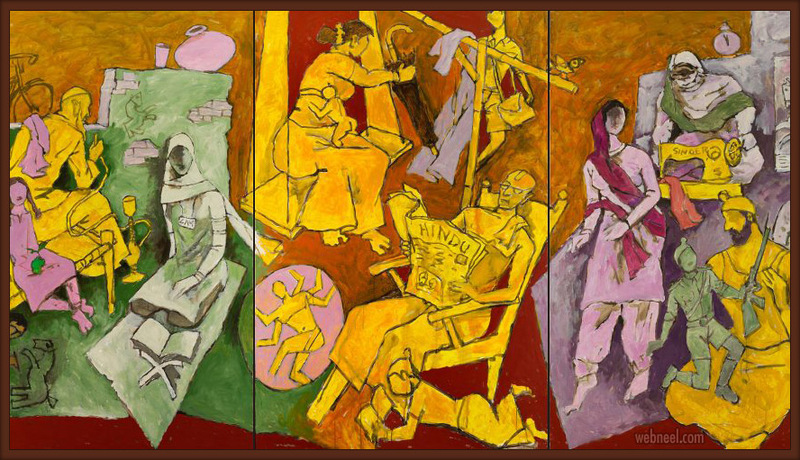 The daily routines of a person were portrayed in the households painting. You can spot a father reading the popular 'Hindu' newspaper, mother sewing, children studying and more. In this paintig, MF Hussain reminds us of Tagore's words"How the language of stone surpasses the language of man". M F Hussain paid his tributes to the great indian poet Rabindranath Tagore through this painting. 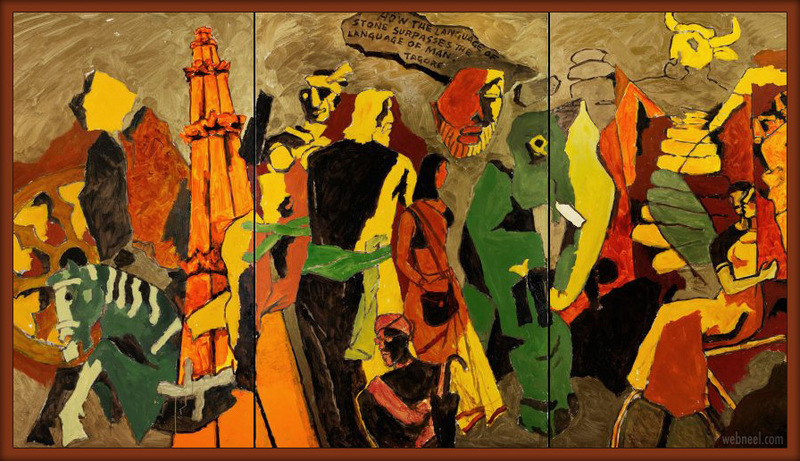 In this Indian modern painting, MF Hussain portays the poets in black colors and other art objecs were given softer colors. Did you know that MF Hussain was known as the Picasso of India. 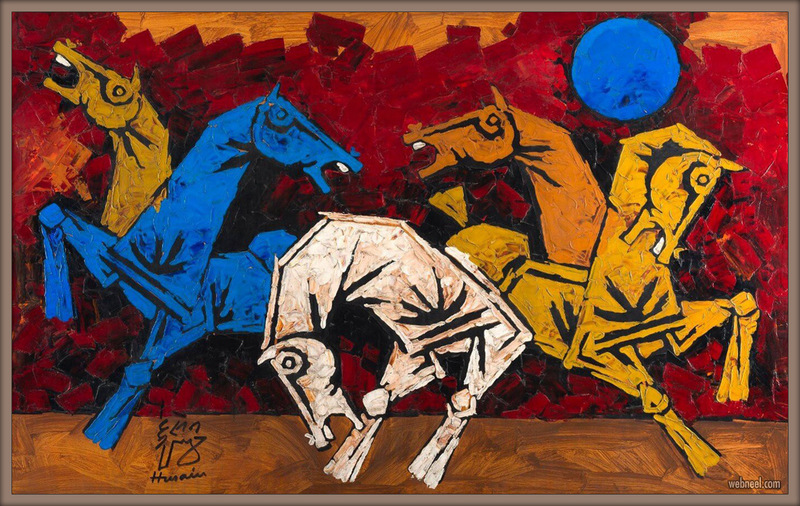 It's a great honor for him, since he believes in iconography and symbolism in all his paintings. MF Hussain was born in a small quaint town in Maharashtra, India. Apart from being an artist, he enjoyed making movies. Gaja Gamini was one of the works of MF Hussain. 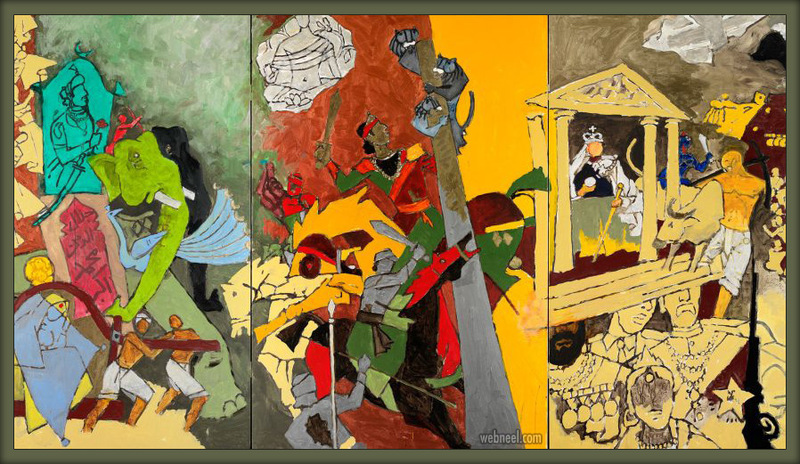 In the three dynasties MF Hussain painting, he shows the Mauryas, Muslim Mughals and the British Raj who ruled our country. Through his painting he shows us that Mauryan civilization was invaded by the Muslim Mughals and British Raj, before we got our freedom in 1947. 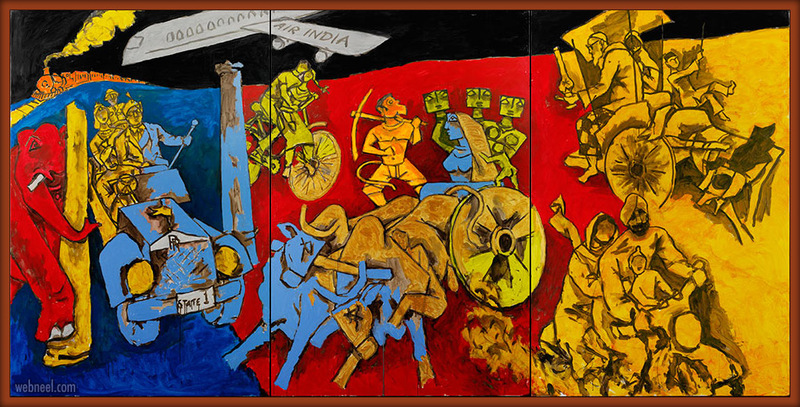 MF Hussain portrays how the lives of Indians have changed in the way of transportation. Initially, bullock carts were used to transport people, nowadays we have motorized vehicles(trains, car) are used for the same purpose. The theme is divided into three colors in the painting, blue(recent), Red(yester years), Golden(Mid period). Animals were used to transport people and used to take weeks or months to reach another place, with modern day civilization faster modes of transport like metro trains, cars etc have made the lives of Indians very smooth.